The wrought iron gates were designed by Mr. Ron Baird and finalized by Procor. Mr. Bonseur, president of Procor, will be one of the special guests. The Danish-Canadian Club gave the wall hanging in blues, greens & golds which is in the foyer. This represents a very valuable gift and we’re hoping their members will be here. The name of the artist is BODIL BODTKER NASS (it is at the side of the piece) who is a well known Danish artist some of whose work was displayed at Expo. This was all hand-worked, comprises 150 different coloured threads. The raw materials were dyed to match the design. The Tibetan Had in the foyer was presented by The University Women’s Club of Oakville; was executed by Almuth Lutkenhaus a European artist now residing in Oakville. The wall hanging beside the adult desk was designed and the design donated by Mr. Walter Sunahara who is with the Provincial Department of Education and acts as an art consultant for schools. He also helped with art selection for the whole centre. He supervised the execution of this handing which was completed by Marie Aiken and Terukit Coakley. The raw materials were dyed to the required colours and all stitching and knitting used. The wall hanging in the B&G foyer was designed by Mrs. Gregor and executed by the members of the Oakville Weavers & Spinners Guild. It represents a winter scene, is entirely handworked. 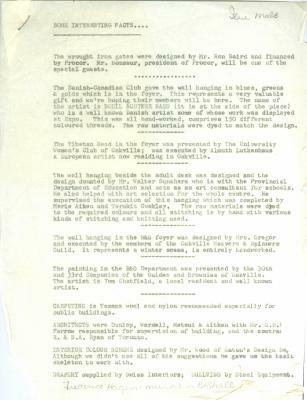 The painting in the B&G Department was presented by the 30th and 33rd companies of the Guides and Brownies of Oakville. The artist is Tom Chatfield, a local resident and well known artist. CARPETING is Texama wool and nylon recommended especially for public buildings. ARCHITECTS were Dunlop, Wardell, Matsui & Aitken with Mr. G.B.R Farrow responsible for supervision of building, and the contractor R. & B.A. Ryan of Toronto. INTERIOR COLOUR SCHEMES designed by Mr. Wood of Eaton’s Design Dep Although we didn’t use all of his suggestions he gave us the basic skeleton to work with. Drapery supplied by Swiss Interiors; SHELVING by Steel Equipment. TOTAL COST of building, including Library and Gallery, $700,000.00 The swimming pool cost is around $500,000.00. AREA of the library and Gallery roughly 22,000 sq.ft. THE PLANT in the Gallery is a Shefflera, and was donated by the Oakville Parks Board. THE CENTENNIAL GARDENS were built at a cost of $50,000.00 which includes landscaping and concrete walks. Plants include several flowering crabs and spring bulbs. The contractor was John Putzer. Already installed is a fountain which will be illuminated, with provision for another yet to come. There will also be eight white oak trees, one of which will be planted on Saturday donated by Mrs. Hazel Matthews in honour of William Chisholm the founder of Oakville.